Our automotive instincts were right on. We'd been avoiding working on the rear suspension for the longest time because we were certain the differential would be a huge mess. And we were absolutely right. If anything, it was even worse than we imagined. Removing the axles meant disassembling the brakes on both sides, and nothing came off easily. 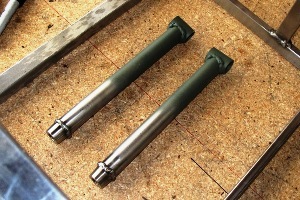 We had to use a two-foot breaker bar just to dislodge the bleeder screws on the slave cylinders. Every other nut and bolt was equally stubborn. 150 ft-lbs on a castle nut? Really? Worst of all were the giant hub nuts, which obviously hadn't been disturbed in more than forty years and were perfectly happy about it. I think the torque specs on these are around 150 ft-lbs, but jumping up and down on the end of a three-foot cheater bar had no visible effect, other than to bend the solid half-inch steel rod we were using to keep the axle from turning. 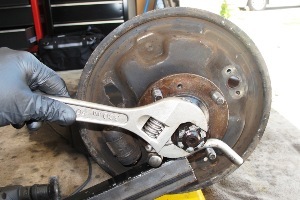 In the end it took our biggest hammer, along with total disregard for safety, property, and common sense, to free the nuts from the hubs. That's all you need to know at this point and we won't be going into any details. 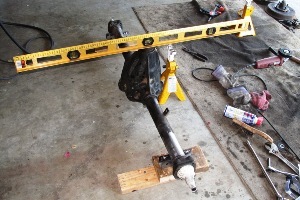 With the axle stripped down, we sawed off the leaf spring brackets and sanded down the axle tubes, then tacked on the new trailing link brackets. 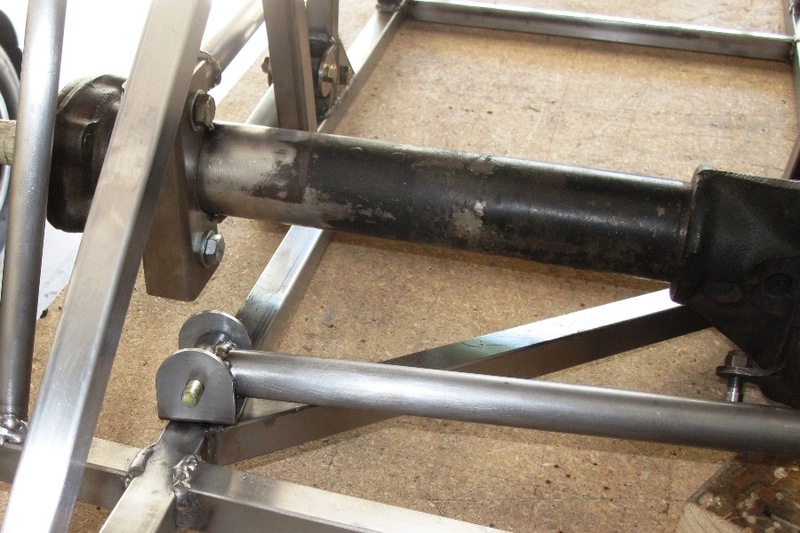 The distance between the trailing link brackets on the frame was 41-19/32", so we made sure that the axle brackets were exactly that far apart. 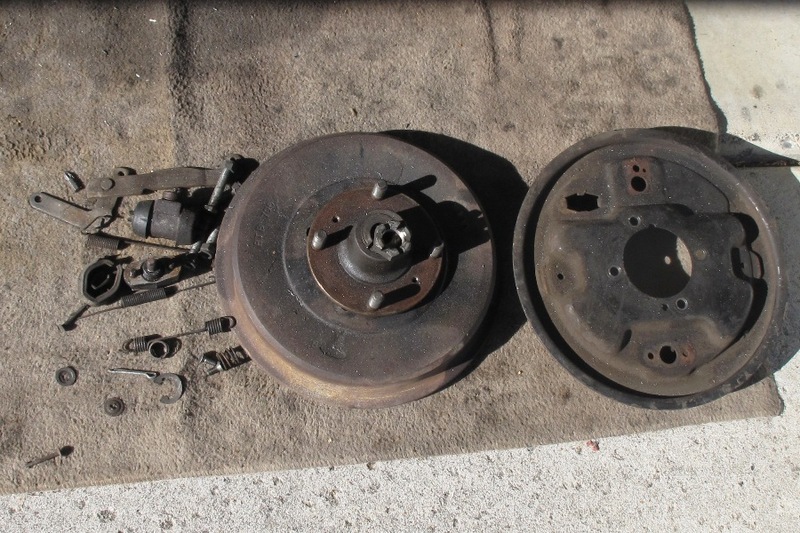 We also moved them back and forth on the tube so the distances between the brackets and the axle flange on either end were exactly the same, and thus avoided doing any math, which would've reduced our odds of getting the brackets on correctly to about fifty-fifty. Tack welding the brackets to the axle was somewhat less encouraging. 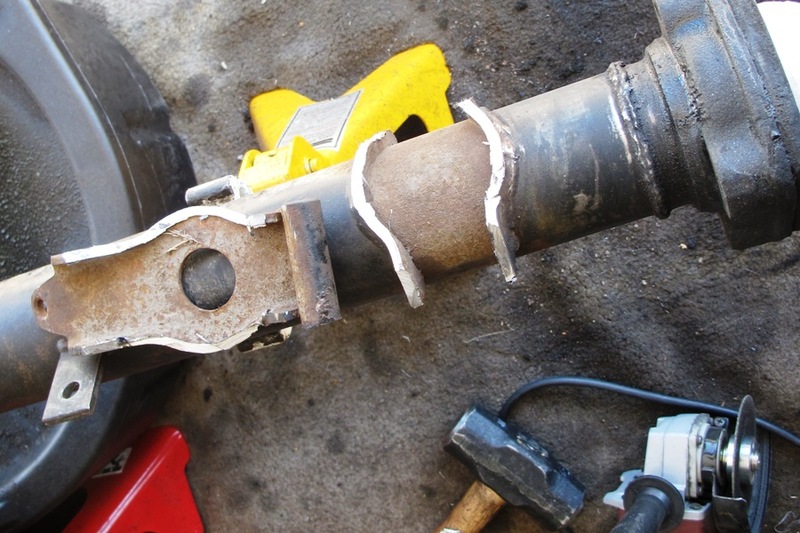 Our little 110v welder was no match for the massive MGB axle tubes, barely melting any metal, and that's with the amperage turned up all the way. Only by aiming the wire directly at the tube for several seconds were we able to get enough of a weld puddle to attach the brackets. That's not going to cut it when it comes time to fully weld the brackets to the tubes, so we're going to do what we usually do in these situations, which is to wait until we figure something else out. 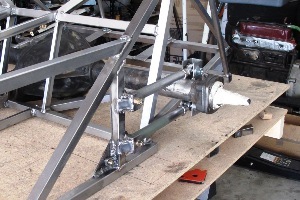 In the meantime, the tacked brackets would suffice to get the axle installed in the frame, which was all we ever really wanted in pursuit of our rolling chassis. 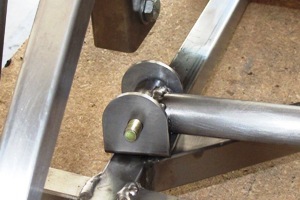 Having given up over the course of the past few weeks on getting any more professional welding help, we went ahead and welded the rear trailing links ourselves, attaching a bushed tube on one end and a threaded tube for a spherical rod end on the other. Our mighty MIG welder made short work of these thin-gauge parts, and except for our typical excessive weld bead, the results looked pretty good too. When we welded the threaded rod ends, we used a technique that we discovered when we welded up the round tubes on the rear of the frame a few weeks ago. Back then we found out that if we beveled the end of a tube before welding, the bead would penetrate all the way down to the bottom of the tube. On the trailing links, this allowed the bead to penetrate well into the threaded sleeve. This was all very encouraging, not so much because of the strength of the welded joint, but because of the fact that we actually learned something. The only thing left to do at this point was to locate the axle laterally by attaching the Panhard rod. 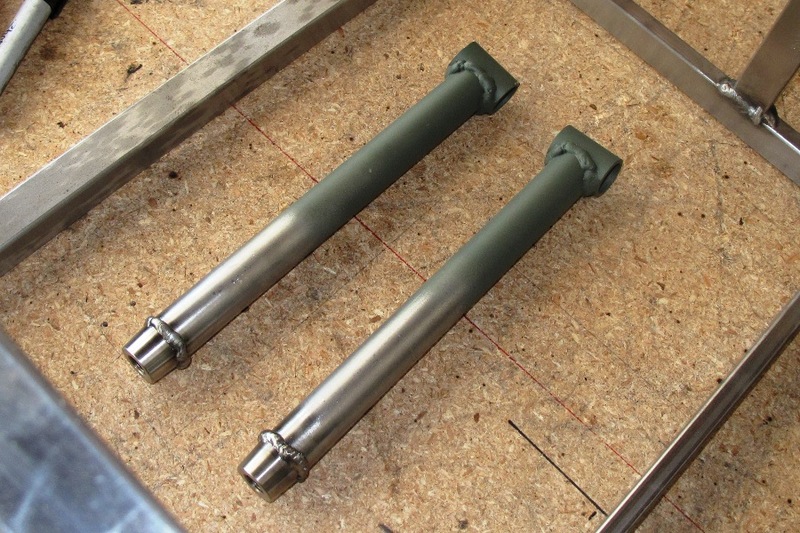 We'd already cut the rod to what seemed to be the proper length and welded ion the ends, but we thought we'd be all clever and make The rod adjustable with another spherical rod end. However, as we all know, clever doesn't work for us and so we now have a Panhard rod that's half an inch too long even at its shortest adjustment. So there's some more cutting and welding to do there yet, but it's not the sort of blunder we haven't seen before, so nothing to worry about. You can't really knock out a major obstacle like the rear suspension without leaving a few little obstacles in its wake, and so on that basis we're calling the rear axle done and moving on. 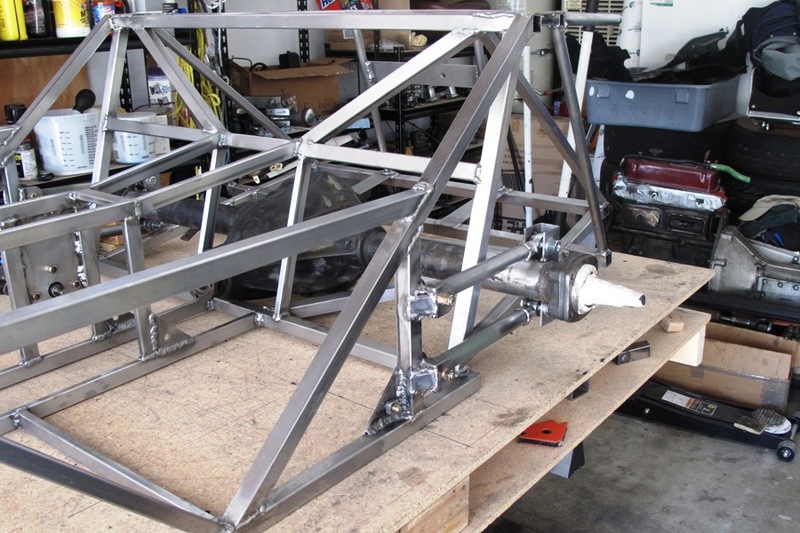 Not a lot left to do on the chassis now before we can take everything apart and paint the frame. We have over 1000 hours into this project, and our completion date has moved solidly up into 2013. It's funny how we used to wonder whether or not we'd ever get this thing built. Not so much anymore. Now we just wonder how much it's going to weigh in the end.